Zambia : WHO places Zambia on the list of Countries at risk of the Ebola disease outbreak. WHO places Zambia on the list of Countries at risk of the Ebola disease outbreak. 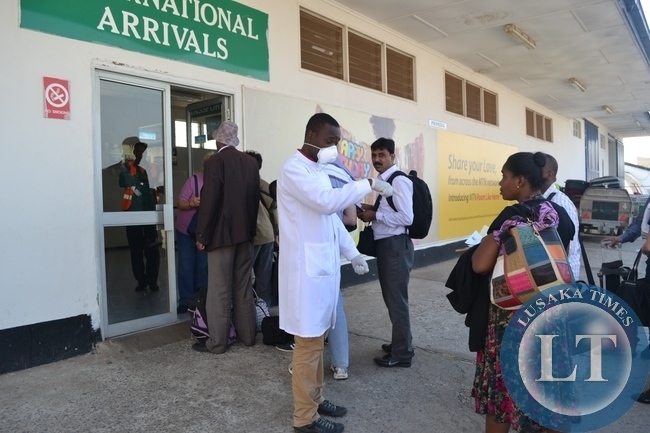 FILE: A HEALTH official going through a medical card of a passenger who had just disembarked an international flight at the Simon Mwansa Kapwepwe International Airport in Ndola . The process is part of screening for Ebola at entry points into Zambia. World Health Organisation (WHO) has placed Zambia among countries at risk of the Ebola disease outbreak. This is due to Zambia’s porous borders shared with countries such as the Democratic Republic of Congo (DRC) that has recorded cases of Ebola disease. WHO Country Representative Nathan Bakyaita said that there was need for the country to be on high alert, adding that was the reason the WHO had partnered with Zambia to help prevent any eventuality. The WHO representative said this when Minister of Health Chitalu Chilufya and North western province minister Naheniel Mubukwanu visited the centre were the Ebola rapid response preparedness team is being trained on handling any Ebola related cases. And Dr. Chilufya has implored the public and health personnel in North Western Province to remain alert and report any suspected Ebola outbreak in the area because North western is a border province with the DRC where the disease has been detected. The minister also assured the people in all border areas with the DRC not to panic over Ebola outbreak in Congo as his ministry is ready for any outbreak of the disease. And Mr. Mubukwanu has urged the people to be on high alert and report any suspected Ebola cases in the area. Just watch and pray! I know our health sector is great. We can contain this! All the best Zambia! Hazaluza Hagain. Dr.Chilufya should stop posturing and do the work professionally. Akainde is praying for Ebola to strike Lusaka because he has a bunker to hide in. PF need focus on that threat or there will be too many by-elections. Ok. I feel like I’m not getting through. The math is distorted and minimized. There are 3500 people “on deck” to be infected. This is due to the incubation period. The latest death occurred in a trading city with over 1 million people residing in it. What am I missing? With a death rate at 50% and NO proven vaccine or treatment available, why the heck is this not reaching the mainstream? Oh yeah!!!! In the name of order and greed. What people need to know is how to protect themselves. Telling them not to punic is not a preventive measure. So here we are again we believed our local doctor, Dr Chilufya knowing that PF ministers don’t care what they tell their docile citizens. Get off the blog dull Upnd maggot. You are the one who is docile Mr. Bonehead, who believe everything the empty tins tell you…its clear MOH hasn’t done enough as WHO dont just issue these statements carelessly. Only when your relatives start showing sudden onset of fever fatigue, muscle pain, headache and sore throat will it sink in your tin…mind you Ebola has a incubation period of 21 days so by time incompetent Chilufya realizes it it will be too late. boy Vincent Mwale has not given us an account of the Cholera contributions!! How can we manage to contain Ebola when we are failing to contain the influx of the Chinese? Any foreigner with money can buy their way into our Failed State! We are simply a people without values, like a tree without roots! A people with strong values are not easily influenced by money! (HH) and UPND are celebrating anything bad about our country. They are happy. The chap is beyond issues. LT should consider banning such they make the platform stink. All insults, no logic and connection to the topics. His personal hatred for HH is beyond. Please leave HH alone. Zambia is bigger than your Lungu who has sold our country and even HH himslef. The topic here is ensuring no Zambian suffers at the hands of this disease. What has changed now? These porous borders have been there since 1976 when EBV was simultaneously isolated from two places, Nzara – S.Sudan and Yambuka – DRC. WHO should not be talking to us like we are nincompoops or responding to the scathing criticism of their bungling in the West Africa epidemic moronically. The good doctor should make a pre-emptive strike by approaching the case like they did with an intensive and extensive public awareness campaign – How does he expect the public to report “suspected cases” if they have limited information about “Ebola-related” signs and symptoms? So the announcement was more political than factual, right? The usual – first denial and then slide into the real news nonsense I assume. Anyway, benefit of the doubt: We are at RISK. So perhaps the politics were less in the reporting by the Hon. Minister. Create a deadly disease and then create a deadly vaccine!! !